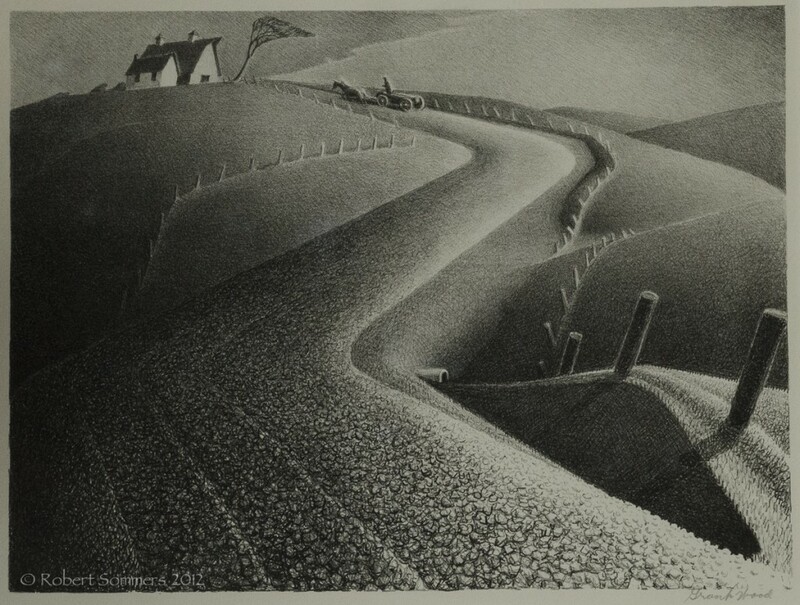 Lithograph, 1940, edition of 250, published by Associated American Artists, signed in pencil. Framed. Two lithographs with handcoloring by Nan Wood Graham printed on Rives paper (Vegetables with Rives watermark), each signed in pencil, from the edition of 250, published by Associated American Artists, New York, with full margins, each in very good condition, framed, acid free mats. Biography from Askart.com: One of the major American Regionalist painters along with Thomas Hart Benton and John Steuart Curry, Grant Wood was born in Anamosa, Iowa, and spent his childhood in Cedar Rapids. Unlike Curry and Benton, he never moved East but remained in the Middle West where he found inspiration for his paintings of prosperous farms and people reflecting idealized American values. However, his work was set apart from many regionalists in that provoked both laughter and social indignation. A good example Daughters of Revolution, 1932, depicting the aloof smugness of women who regarded themselves as emblematic of the country’s founding values This painting was a retaliation by Wood against DAR members who had criticized him for completing their window in Germany instead of America. Much of his satire was good natured and humorous. For two summers, Wood attended the Minneapolis School of Design and Handicraft and Normal Art as a student of Ernest Batchelder, and he had brief times of study at Iowa State University and the Art Institute of Chicago from 1913 to 1916. After World War I, he taught high school art in Cedar Rapids. Asserting that he “had to go to France to appreciate Iowa,” he had several trips abroad, and in 1923 enrolled in the Academie Julian in Paris, but he determined to make his life in Iowa because “all the really good ideas I’d ever had came to me while I was milking a cow.” In 1932, he was co-founder of the Stone City Art Colony and Art School and he became director of the Public Works Art Project in Iowa. He was also an Associate Professor of Fine Arts at the University of Iowa. His work can be divided into two periods, the first being views of Cedar Rapids, other landscapes including scenes of Europe, and a few portraits. However, in 1928, his work changed when he traveled to Munich to oversee the making of a stained-glass window for the Cedar Rapids Veterans Memorial Building commissioned by the Daughters of the American Revolution. Seeing the severe, austere new style of painting in Germany combined with work from the late Gothic period, he developed a unique new style of his own that treated mid-western subjects with gothic overtones, satire, and caricature. In 1930, he produced his first major landscape painting, Stone City, that had exaggerated perspective and unique naive treatment. From that time, his paintings had a simple innocence and fantasy that transported the viewer into another world, often that of a child. He also did many murals and a few lithographs, completing nineteen between 1937 and 1942, the year he died of cancer at age 50 in Iowa City.